Congratulations! You’re getting married! You’re preparing for one of the most exciting days of your life. Weddings are a great time of celebration and we are here to make your church service run smoothly for you. In choosing to get married in church you will be asking for God’s blessing on your life together. We believe that this can be a great strength for marriage and we encourage you to join us for worship in the church as part of your preparations. 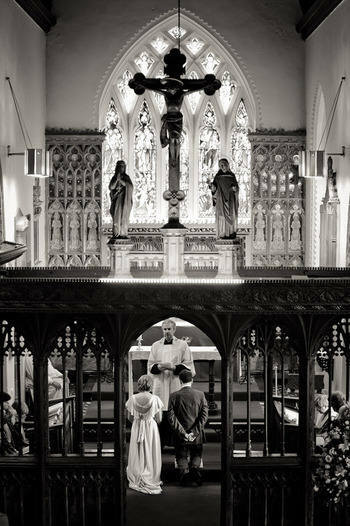 We are able to offer marriage services to those who live in our parishes or who are on the Church Electoral Rolls or who have a qualifying connection to the local church. If one or both of you have been previously married and divorced then we may be able to help but we will need to interview you, as the bishop lays down guidelines for the remarriage of those in this situation. We take our responsibilities seriously in helping you prepare for marriage and usually meet with you on a number of occasions before the day. First, to get to know you and talk through the content of your service, including hymns, readings and music; then to look through the marriage service and have a chance to reflect on the vows you will be making; finally, a rehearsal in Church probably in the week before the Wedding. Fees are charged for the wedding services, and for ‘extras’ such as Organist, Bellringers and Choir and you will be advised of the likely cost when you book your date.